South Korea has elected a liberal as President after almost 10 years of conservative rule. It is interesting to note how the same dilemma facing the new South Korean President Elect is being faced in France as well as the New President Elect prepares to take office on May 14. Both have problems with majorities in their legislatures. There is also the on-going elections in Iran as well as we noted in our last edition of Notations. Iran's elections is starting to get especially interesting in light of President Rouhani's latest campaign speeches. He has gone after the main conservative challenger, Raisi (the head of the Quds Foundation) hard with allegations of corruption and his conduct as of the high ranking judicial officials of the past 38 years. Social Media (especially Instagram) has been abuzz of the on-going efforts--including the accounts of Jamaran.ir (affiliated with Khomeini's grandson) along with the official account of President Rouhani Himself. Iran's Official News Agency, though, continues to be supportive of the President as domestic media continues to be on the attack. This is as Iran and Pakistan are in a diplomatic tug of war in the aftermath of the death of Iranian Guards--and as Iran and Saudi Arabia are at it in the aftermath of comments by the Saudi Deputy Crown about attacking Iran. On May 21, local elections will be held in Croatia’s capital, Zagreb. A progressive green-left platform called “Zagreb is OURS!” offers an opportunity to oust the populist Milan Bandic, an infamous former social-democrat known for his involvement in major corruption scandals, who has governed the city for the past 16 years. With the rise of nationalism, populism and historical revisionism in Croatian society, these local elections will have a major influence on national politics and daily life in the country. DiEM25’s CC has determined that the political program of Zagreb is OURS! is in accordance with our Manifesto and European New Deal. The program advocates the return of decision-making power to neighborhoods, and creates models where citizens collectively decide on how the city should be governed and develop. 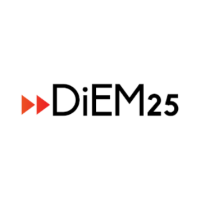 DiEM25 is a pan-European movement where its members take key decisions collectively. So all members of all nationalities – that means you! - get to decide what our position should be for this vital election. Should we support Zagrab is OURS!, or not? Just head over to the Members Section to make your choice! The deadline for this vote is Wednesday, May 17. DiEM25 members have previously engaged in democratic discussions to arrive at their positions for French elections, the Brexit referendum, as well as the Italian constitutional referendum. This is the first time DiEM25 members are voting on whether to support a candidate in local elections. The creation of new “Rebel Cities” is a major struggle which concerns all progressives in Europe, so please do vote.